The first floor of our church has an array of classrooms for bible school and our kids ministries. The second floor houses our beautiful and newly renovated sanctuary, perfect for worship and fellowship. The church is accessible from either Beaver Street or W. Auklet Avenue, but the primary parking lot is at the end of W. Auklet Avenue. The upper curb side parking, accessible from Beaver Street, is for those who need to avoid using stairs. If coming from north of Palmer on the Glenn Highway, turn left at the first traffic light in Palmer, onto the Old Glenn Highway. Travel east for one block and turn left onto N. Alaska Street; take the first left onto W. Auklet Avenue (a gravel road). 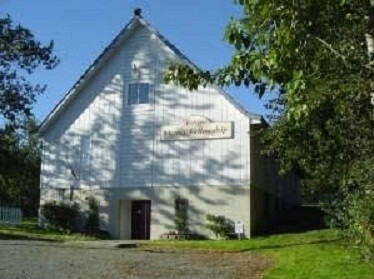 Go to the end of the road; the church is located at the end of W. Auklet Avenue on the right. If traveling from south of Palmer on the Glenn Highway, turn right at the third traffic light in Palmer, onto the Old Glenn Highway. Travel east for one block and turn left onto N. Alaska Street; take the first left onto W. Auklet Avenue (a gravel road). Go to the end of the road; the church is located at the end of W. Auklet Avenue on the right. For more information, please feel free to call us at (907) 745-5045.